If your loved one was an avid golfer then it only seems appropriate to include their passion in their celebration of life. 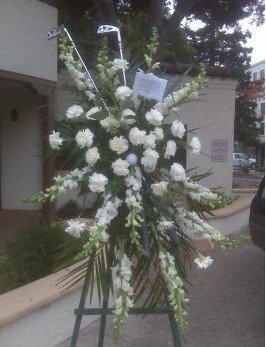 You can pay them a high honor by using a golf theme when planning your memorial service. Preparing a golf themed celebration of life is not as difficult as you might think. It only takes a bit of time and creativity to plan the theme, collect decorations and pictures, decide on the menu, flower arrangements and choose an appropriate music selection. Be sure to use your time wisely. You will need time to locate the decorations, photographs, music selections and decide on a menu for the service. Take into consideration everything that your loved one enjoyed about golf while planning the theme. Gather clothes, pictures, golf equipment and anything else you can find that would compliment the theme. You can find inexpensive decorations at Amazon. (see below). Please note, as an Amazon Associate, I receive a commission from purchases. Napkins and paper plates could be ordered with a golf theme. Pictures of your loved one on the green can be made into a collage and displayed, perhaps with their golf bag and clubs next to it. Golf balls, tees and turf can be used to accentuate table centerpieces and displays. Display any awards, trophies or ribbons they may have accumulated. A favorite golfing outfit put on display is a nice touch. A buffet setup would be ideal for this theme. A turf-green table cloth would accentuate the golf theme. Golf tees could be used as toothpicks for finger foods. Hard-boiled eggs and other such foods that resemble golf balls can be strategically placed. People personalize golf balls for weddings, birthdays and retirements. Why not for funerals? You can personalize them with the name of your loved one, year of birth and year of death, or a favorite expression. Simply upload online what you would like to have printed. Personalized golf balls make a perfect takeaway gift for the attendees. A less expensive option is to give out personalized golf tees. A favorite saying by your loved one could be printed onto the tees. A golf bag would make a nice container to decorate with flowers and ferns. Ferns and tall grasses are good choices to imitate vegetation around water holes. White, budded, but not yet bloomed, roses carefully placed on a patch of grass is a nice touch to add as a centerpiece. As there are not any traditional music associated with golfing, choose the type of music your loved one enjoyed the most. Put together a selection of favorite and appropriate songs and combine them into a musical slide show. There are sure to be many songs that will trigger memories for your celebration. In your photo-video presentation you can include many golfing photographs of great times that were had on the links. These are great ideas to include in your celebration of life event. Those who knew and treasured your loved one will make many fond reflections during this celebration. See Funeral Poem for a Golfer. Or, with your imput, we can create for you a custom funeral poem to celebrate the uniqueness of the deceased. It is certain that this will be an event to remember and commemorate a special life.